The Kilnsey Trekking and Riding Centre is a BHS Approved establishment, which is your guarantee that the horse care, safety and instruction are of the highest standard. We have been in business for over 20 years and we can provide some form of equine entertainment for everyone; whether you are 4 or 104, we have an activity to suit you! 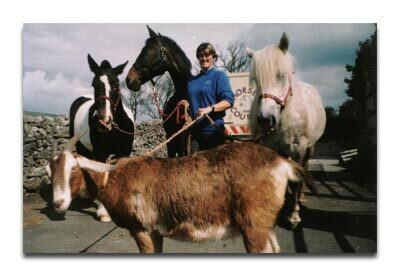 We offer horse treks and hacking out on the Yorkshire Dales. The Yorkshire Dales are an area in northern England of outstanding natural beauty, a large part of which has been designated as one of the ten national parks of England and Wales. TREKS are suitable for people with NO riding experience at all, and can also give confidence to any nervous rider. All treks are geared to the speed of the least experienced person on the trek, so there’s no danger of galloping off into the sunset if your only previous experience has been riding a donkey on Whitby sands! Most treks are done at a WALK. HACKS require more experience, usually we ask that people can hold their position in canter before we will accept them on a hack, this is for your own and our horses safety, as well as to aid the enjoyment of the other riders. These rides are usually smaller groups than a trek. The RIVER RIDE A short ride of 40mins following the path of the River Wharfe. An ideal introduction for very small children and nervous riders of all ages, with very little hill work so suitable also for disabled riders. 1 HOUR AND 1½ HOUR TREK This trek takes us around the low-lying pastures of the Kilnsey Park Estate, where you will get a taste of riding and this ride acts as an appetizer for the history of the area. Some hill-work is involved in this trek, but it is suitable for riders with little or no experience. Wasn’t overly impressed. Did the hour and half pasture ride. Horses ok, but a bit unkempt. Needed a good brush and tack review. The most dissapointing part was down to the leader of the trek who seemed to have forgotten to take a happy pill that morning, hardly spoke all the way round, was off hand with one of the riders and insisted on smacking the poor horse she was on all the time. Won’t be re visiting. Kilnsey Trekking and Riding Centre is a BHS Approved & Pony Club Approved Riding Centre, we offer children access to all the benefits of the Pony Club and as a Pony Club Centre Member, you can work your way through over 30 different Pony Club Acheivement Badges. And as BHS Approved centre all riding lessons are taught by registered BHS Qualified Instructors.